This image, speckled with blue, white, and yellow light, shows part of the spiral galaxy IC 5052. 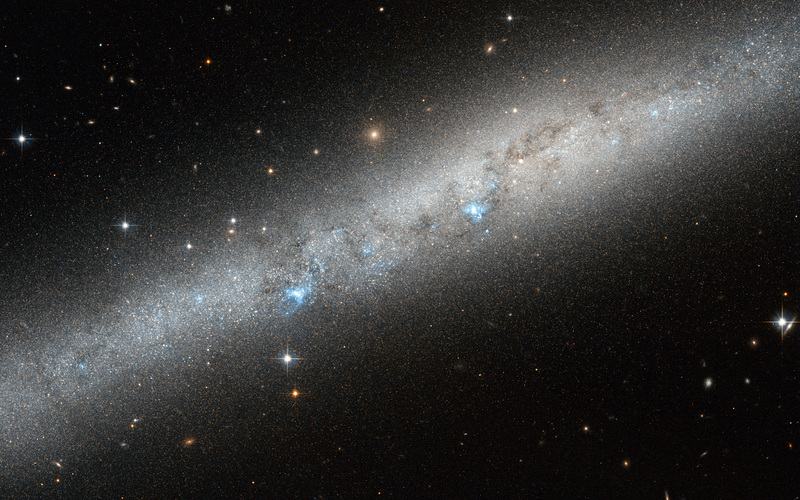 Surrounded by distant stars and galaxies, it emits a bright blue-white glow which highlights its narrow, intricate structure. It is viewed side-on in the constellation of Pavo (The Peacock), in the southern sky. 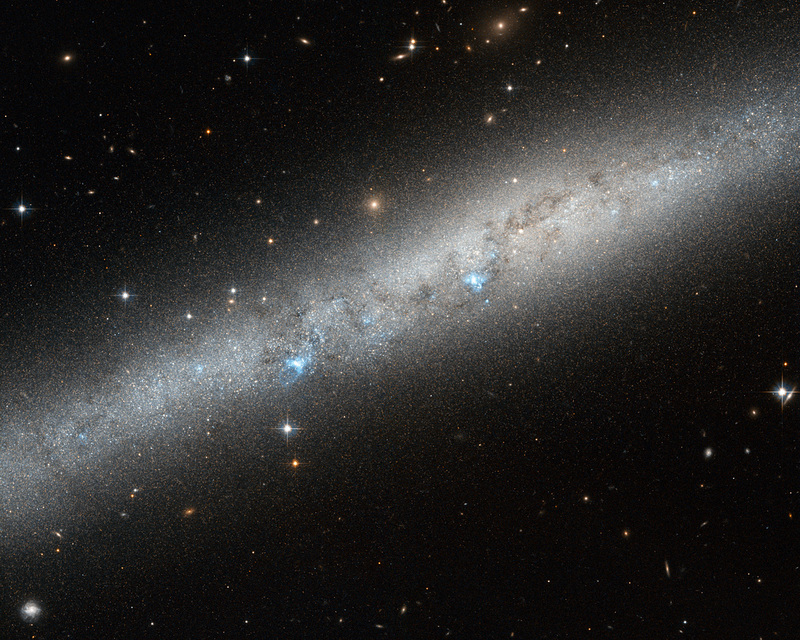 When spiral galaxies are viewed from this angle, it is very difficult to fully understand their properties and how they are arranged. IC 5052 is actually a barred spiral galaxy – its pinwheeling arms do not begin from the centre point but are instead attached to either end of a straight "bar" of stars that cuts through the galaxy's middle. Approximately two thirds of all spirals are barred, including the Milky Way. Bursts of pale blue light are visible across the galaxy's length, partially blocked out by weaving lanes of darker gas and dust. These are pockets of extremely hot newborn stars. The bars present in spirals like IC 5052 are thought to help these formation processes by effectively funnelling material from the swirling arms inwards towards these hot stellar nurseries. A version of this image was submitted to the Hubble's Hidden Treasures image processing competition by contestant Serge Meunier. Position (Dec): -69° 12' 4.67"